WJSG Internet Radio: Rare and previously unreleased Led Zeppelin demos to be auctioned next month. Rare and previously unreleased Led Zeppelin demos to be auctioned next month. A number of rare and previously unreleased demos recorded by Led Zeppelin during the making of their 1975 album 'Physical Graffiti' are to be auctioned next month. The batch of recordings includes alternate mixes of songs such as 'Trampled Underfoot', 'Driving To Kashmir', 'Custard Pie', 'In The Light (Everyone Makes It Then)', 'Swan Song Part 1', and 'Swan Song Part 2'. RR Auction, the company behind the auction, state that the recordings are different, with some completely instrumental, to the final album versions. 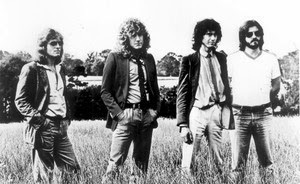 A short sample of the unreleased Led Zeppelin recordings can be heard above while a full 30-second clip of 'In The Light' can be heard below. The auction, named Marvels Of Modern Music, runs from March 13-20. Meanwhile, Led Zeppelin guitarist Jimmy Page recently revealed that the band's long-mooted remastered reissues will be released this year. Page first revealed that he was working on remastering a number of Led Zeppelin albums back in 2012. He has now posted a New Year's message on his website stating the first reissues will come out later in 2014. He wrote: "It's good news for the New Year. The first of the Led Zeppelin releases – comprising of Led Zeppelin I, Led Zeppelin II, Led Zeppelin III and their companion discs – will be released this year. I've also been working on some of my own material from the archives that will be unleashed in 2014." Last year Glastonbury organizer Emily Eavis revealed that Led Zeppelin are at the top of her dream list for future headliners for the festival.